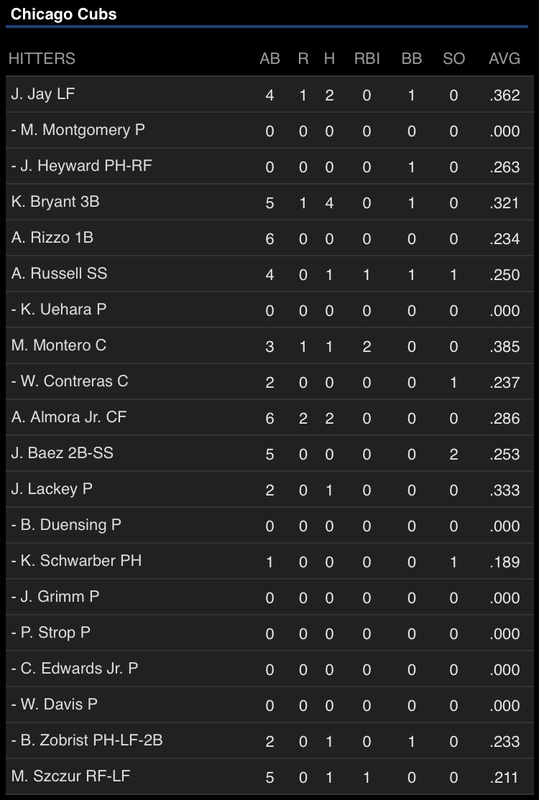 LIVE: Cubs take three out of four from Philly – Let's Blog Two! It’s Zach Eflin (0-0, 1.89 ERA) versus John Lackey (2-3, 5.10 ERA) in the series finale from Wrigley Field today as the Cubs will take on the Phillies at 1:20 p.m.
Series finale vs. the #Phillies! It’s going to be another brisk one at Clark and Addison. Check out this story from Lauren Comitor of The Athletic about Willson Contreras and his thoughts on Twitter, cold weather and Venezuela. The Cubs would love to see John Lackey get back on track today. Lackey has really struggled in his last three starts (18 IP, 21 H, 4 BB, 13 K, 6.50 ERA) but he has an opportunity to turn it around at home today against a very average Philadelphia offense. The concern with Brett Anderson is warranted but cementing a solid top four in the rotation should be the real task for the Cubs. Good stuff here from Jesse Rogers of ESPN about the Cubs’ first inning struggles. The pop fly cheering at Wrigley has been extra bad this year. Side effect of a team winning a World Series, I guess. Like we'd know. That RBI double from Addison Russell is his first run driven in since April 24 in the big 14-3 win in Pittsburgh. Russell has been in a bit of a slump and his OPS has fallen from .810 on April 25 to .682 prior to today’s game. 1-0 Cubs after one inning. True story, I grew up with @superSZCZ4 and his brother Marc. He had triceps and a 6 pack when he was 8 yrs old. Maikel Franco homers for the Phillies to tie the game 2-2. Lackey has given up eight home runs so far this season. After letting up two singles to start the fifth inning, Lackey limits the damage to one run and the Cubs trail 3-2. Despite no walks and six strikeouts, Lackey has not been sharp today and the Cubs’ rotation problem is still very much alive. (Harry Doyle voice): Well, you can close the book on Lackey. 5+ IP, 9 H, 3 ER, 0 BB, 6 K.
Carl Edwards Jr. gives up a solo home run to Cameron Rupp and the Phillies go up 4-3. First run of the year given up by Edwards. Miguel Montero added a solo shot of his own to tie the game in the eighth inning. @miguelmontero26 adds to his "clutch Wrigley Field home runs" collection. With two on, one out and Kris Bryant at the plate, Zobrist gets picked off at second, Bryant singles and Rizzo grounds out to end the ninth inning. Cubs are 1-1 in extra innings this year which is where they’re headed this afternoon. 4 hours and 24 minutes later (The Godfather Part II is 3 hrs 20 min), Cubs win 5-4 in the 13th on a throwing error. They take three of four. I would call it a marathon, but many people run marathons in less time than this game took. With the 5-4 win, the Cubs move to 16-12 and stand atop a cluttered division. Cubs fans will be more than willing to take the win, but they are still far from comfortable. It had to be assumed the talented starting rotation would have turned the page by now, but that hasn’t happened. Plus, while the Cubs are scoring runs adequately, many hitters are struggling, especially Kyle Schwarber. Jesse Rogers met with Miguel Montero after the game. Things won’t get any easier as the Yankees visit Wrigley Field tomorrow for a weekend series. Boy, do they have a monster playing right field. Aaron Judge is 25 years old and a gargantuan 6-foot-7, 282 pounds. He has hit 13 home runs this year and boasts an absurd slash line of .330/.433/.818. That also means Aroldis Chapman will receive his World Series ring, and former Cub Starlin Castro will return to Wrigley Field for the first time since being traded following the 2015 season. Chapman was an essential part of the Cubs’ playoff success last year and Castro remains a favorite among many in the Cubs’ clubhouse. I hope Cubs fans give each player the ovation they deserve.